The Hotel Barbiani B & B is a 2-star hotel in Rivabella di Rimini, family run. It offers a bed and breakfast service and has 24 hour concierge, disabled access, WI-FI, garden and free parking. Small and medium-sized pets are allowed. 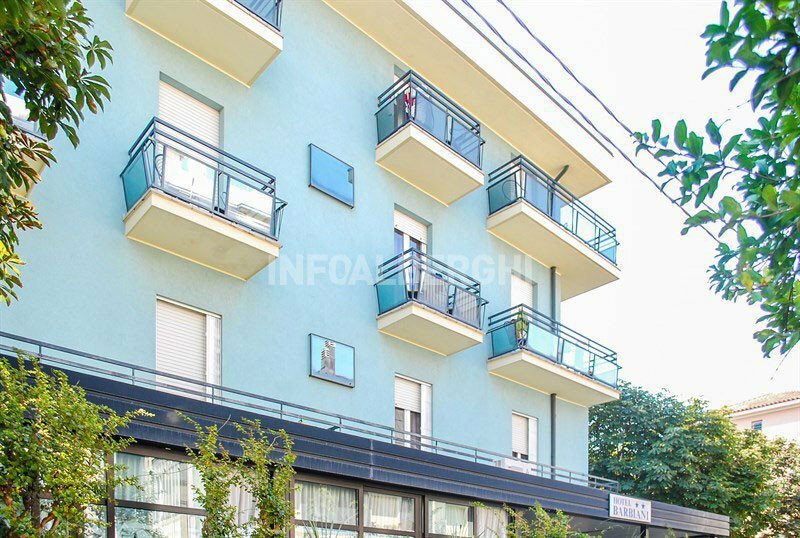 The property is located in a quiet area in Rivabella di Rimini, just a five minute walk from the beach. Balcony with sea view, WI-FI, air conditioning, safe, TV, telephone, private bathroom with shower and complimentary toiletries, hairdryer, air conditioning, minibar on request. Garden with equipped area, open-air porch, free bicycles, lift, 24 hour concierge, lunch / dinner area, newspapers. WI-FI : present throughout the entire hotel. SERVICES FOR DISABLED : entrance with inclined ramp, lift for disabled people, rooms with wheelchair maneuvering space, bathroom with shower accessible. BREAKFAST : international buffet breakfast with homemade desserts, fruit, eggs, yogurt, cold cuts and first courses. In the hotel: outdoor playground area, table football table, ping-pong. In the room : cots for a fee. At meals : kitchen for preparing baby food, table seats. On the beach : live entertainment, playgrounds. Hotel Barbiani has an agreement with Bagno Micky n. 7. Entertainment service, playgrounds, ping-pong, bowls, cabins are available. The prices of the price list are per person per day.